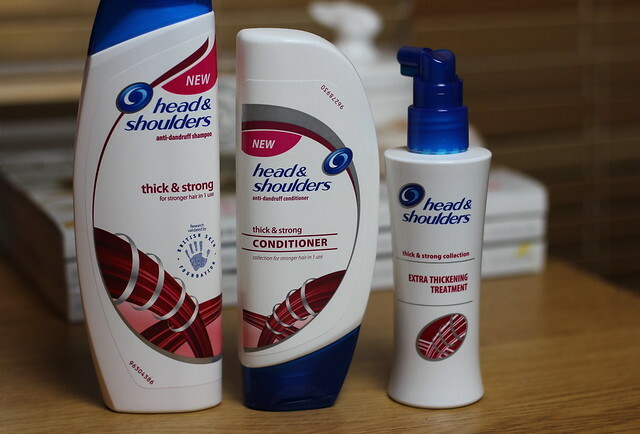 It’s never the most glamorous of products, one designed for anti-dandruff – but I’m actually a huge fan of Head & Shoulders and find myself coming back to it in its various different varieties time and time again. I try other things, like them and everything but then find that keeps bringing me back time and time again whenever my scalp plays up. Then they have gone and released this new variation – to deliver thick and strong hair – so basically bringing the ultimate combination together for a healthy scalp, volume and conditioned hair. All in one range. The range contains the usual Shampoo and Conditioner but also has the addition of the Extra Thickening Treatment that is sprayed on to the roots to give hair and scalp an extra boost – this is a new addition to the Head & Shoulders offering and one that really is a wonderful scalp refresher and leaves hair feeling both clean and fresh and lifted at the same time. All together this trio make a pretty dark awesome combination for anyone who has a sensitive scalp, suffers from dandruff but doesn’t want to sacrifice either volume or condition of their hair. It almost annoys me when I think how many other ranges only offer something for one hair type – for oily hair (stripping the ends of moisture), for volume (can leave hair dry all over), for dry hair (can end up limp and lifeless). But this one left my hair feeling good in all three ways (conditioned, with volume AND scalp feeling good) and instantly impressed. So impressed I’ve told the boy to back off (he has a habit of using up anything as soon as I decide it’s a favourite!). All round – a total winner all round. See, not all glamour in beauty but sometimes it’s the non-glam ones that are worthy of the raves the most! My husband Love head and shoulders but I have coloured hair so have to stay away, I am tempted to get this for him as I am sure he would love it! I completely agree with you, sometimes it’s the little guys that make the best beauty heroes. I like to use Head & Shoulders; it’s not only good for keeping my scalp in check, but also it seems to keep my hair free of oil the longest. I use the lemon one as it’s supposed to be great for stretching out the time between hair washes. This sounds like an amazing range for H&S to have brought out, and I’ll be definitely having a browse for them the next time I’m in Boots. Some new Shampoo and conditioner is on my list. this shampoo (i used the 2/1) made my hair greasy after i washed it!